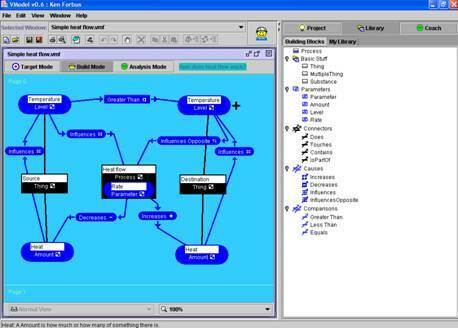 This project is using ideas from qualitative modeling to create a graphical notation, with computer support, that enables middle-school students to learn both particular areas of science and the process of modeling itself. The prototype modeling system we have created is called VModel. Students use VModel to create, analyze, modify, discuss, and disseminate their models. Ultimately, we think software like will be for modeling what word processors are to writing essays and spreadsheets are to mathematical analyses: A tool for creating, revising, and disseminating student ideas, creating an artifact that captures their evolving understanding and that can serve as a focus for discussion. Students can build qualitative models of interesting phenomena. Building models promotes transfer, as measured by re-use of prior models. Students use terms from our graphical language for physical phenomena even when they are not using the software. Teachers report shifts in the kinds of student thinking with repeated use of the software: More analysis of systems, and explaining behavior in terms of mechanisms. This project interacts synergistically with the work we are doing in the NSF Center for Learning Technologies in Urban Schools (LeTUS). A key focus of the Center is creating and deploying an alternate middle-school science curriculum in the Chicago and Detroit public school systems that is inquiry-based and supports national standards, through the medium of work circles, collaborative arrangements involving researchers and teachers that support these efforts. We have operated two work circles to develop curricula that have been used to explore these ideas. One of these curricula, on solar houses, has been rolled out on a wider basis through Chicago schools via LeTUS. (This curriculum uses another of our technologies, self-explanatory simulators, to provide simulation laboratories that complement physical hands-on experiments.) The teachers who collaborated with us in these efforts have made a variety of valuable contributions to the project, and we would like to thank them here: Adam Dorr, Kiesha Korman, Beverly Miller, Carlos Rodrigues, Deborah Rogers-Green, Carol Scafide and Judy Whitcomb. We are currently focusing our efforts in two directions. First, we are analyzing the data gathered in our classroom work and writing up appropriate publications. (For a selected list of publications click here.) Second, we are implementing more sophisticated coaching in VModel, off-loading more intense reasoning to an email-based server architecture to keep the classroom client software lightweight. (This RoboTA architecture was developed in our prior NSF-sponsored work on articulate virtual laboratories.) Using a combination of analogical and qualitative reasoning, the new software coaches will compare student models to normative models, point out discrepancies between the predictions of a student model and simulator behavior, and prepare assessment reports for teachers summarizing class progress and patterns of misconceptions. At the end of the project, all software and documentation will be made available as open source. We are already making the current version of VModel publicly available, so that interested teachers and researchers can use it.